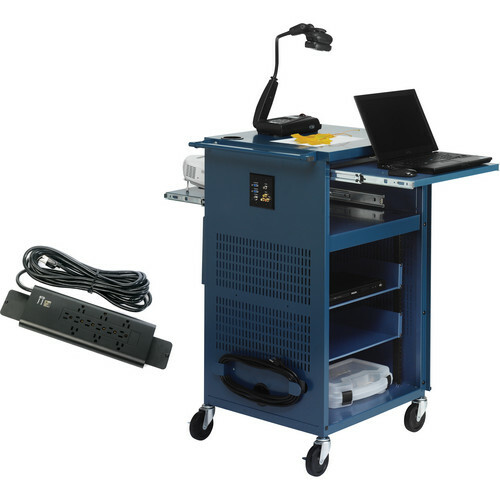 The topaz Bretford Presenter’s Assistant for Learning Multimedia Presentation Cart with 12 Electric Outlets securely stores and easily transports all your electronic multimedia devices for the classroom. It is a compact presentation cart, which can store a data projector, document camera, and a DVD player. It includes rails for 19" (482.6mm) rack-mounted sound systems, power units, and computer equipment, with added room for a speaker system. This cart is designed to work with a laptop computer with the pull-out shelf at standing height. It also includes a perforated locking cabinet with front and rear access and a dual-plate cut-out that supports an optional data plate pass-through for easy plug-in of laptop to projectors and AV equipment. The projector pull-out shelf locks away inside the cabinet when not in use to deter theft. The TCPE10 12-outlet electrical strip attaches to the bottom studs of the cart. A suitable platform for presentation electronics where multiple laptops are used throughout the day. Complete multimedia cart supports a data projector, document camera, DVD player, sound system, audio mixer, and 19" (482.6mm) rack-mounted electronic equipment. Designed to accommodate an optional double gang pass through plate that provides a quick and easy method for anybody to connect a laptop computer to electronics without rearranging data cables. Lower cabinet features 19" (482.6mm) rack rails with 13-unit spacing and includes 2 accessory shelves for non-rack-mounted equipment. Upper cabinet supports an LCD projector on a pull out shelf that can be retracted for secure storage when not in use. The rear space can be used with speakers and features hole pattern for a Califon PI-39 Series field array speaker (sold separately. Standing height pull out shelf can be used with a laptop for presentations or for extra workspace. Side handle allows for easy transportation from one location to another and offers protection for the side panel mounted cord winder and optional data pass through plate. Welded cabinet provides maximum strength and durability and ships with doors and panels installed to minimize the assembly time. Side panels are perforated to cool equipment and dissipate heat when in use. The four 4" (101.6mm) hard rubber casters, 2 of which can be locked, have a load capacity of 115 lb (52.16kg) each. The cart includes a surge and overload protected, 12-outlet electrical assembly with on/off switch and 12' (3.65m) grounded power cord. Electrical unit mounts inside the lower cabinet and cord wraps on exterior cord winder. It is constructed using an average 30% post-consumer recycled steel content and finished in environmentally friendly powder-paint. Steel components are 100% recyclable at the end of the product life cycle. It is certified to GREENGUARD Children & Schools Indoor Air Quality standards. Made in USA, Chicago area manufacturing facility using union labor. Provides 12 surge and overload protected outlets to power an electronic device kept within the cart. Secures to the bottom shelf using mounting studs and is easily accessed from the rear cord management door. 20’ (6.096m), 3-wire power cord with grounded plug can be wound around a cord winder on the side panel when not in use. Environmental Prime Steel: 25 to 35% post-consumer recycled content. All steel components are recyclable at the end of the product life cycle. Box Dimensions (LxWxH) 51.75 x 30.5 x 27.0"